Over the years, we've found that good Bible storybooks and family devotional material is difficult to find. Some books aren't faithful to the text of Scripture, some are dry, sterile and devoid of heart, and some are so juvenile that they present the Bible's stories with the seriousness of a comic strip. We wanted books that would help us teach our kids the many stories of the Bible, open up opportunities for family discussion and, preferably, provide clear application to our lives. So after a lot of trial and error, here's a list of our family's recommendations. The Jesus Storybook Bible: Every Story Whispers His Name by Sally Lloyd-Jones – This book, easily my favorite Bible storybook, is fabulously illustrated and a great read for all ages. The author skillfully shows how the Bible's stories are not disjointed, moral lessons, but rather how they are all oriented around God's "Never Stopping, Never Giving Up, Unbreaking, Always and Forever Love." The illustrations are suitable for kids, but not silly or disrespectful. It's a Bible storybook that we will read over and over again in our family. For reviews on other Bible storybooks, head on over to Redeemed Reader here. Redeemed Reader also has a review of Sally Lloyd-Jones latest release, Thoughts to Make Your Heart Sing, here, which I've not yet read but have heard good things about it. Long Story Short: Ten-minute Devotions to Draw Your Family to God by Marty Machowski – If you want something a little more substantive than a Bible storybook, this book is a must. It is highly recommended by many and with good reason. It is not a picture book – it is a devotional book designed to be used 5 days a week. Each lesson contains a Scripture reading, a brief explanation of the passage, a few questions to encourage discussion, and finally, suggestions for prayer. For our family, in which ages range from early elementary to high school, this book has been ideal. 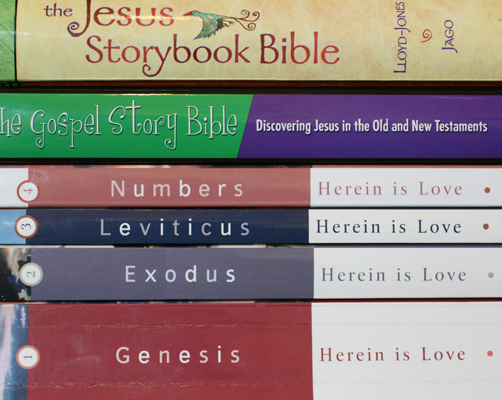 There is substance for all ages, and each lesson points the reader to Christ. Long Story Short covers the Old Testament in 78 weeks, and the recently released Old Story New covers the New Testament in 78 weeks. If a family stayed on schedule, they would cover the entire Bible in three years. Or, if your family would prefer an illustrated book, there is a Bible storybook also by Marty Machowski that covers the same 156 lessons called The Gospel Story Bible. As with the devotional books, the goal of the author is to "connect events in the story to God's larger redemptive plan." The entire program is designed as a companion to a church Sunday school curriculum package, but these three books are great for family use whether your church uses the bigger package or not. Learn more about the whole program at their website here. Herein Is Love, Vol. 1: Genesis by Nancy Ganz – Nancy Ganz has written a great, readable series that focuses on the deep love of God. The Bible is a love story – God loving His people – and she shows how that theme is present in the Old Testament. This is not a picture book. It is subtitled "A Commentary for Children," and that's a fair description. Each chapter is a healthy read, so it would be a better choice for families whose children are used to sitting and listening. It has substance for a wide variety of ages, however, so that makes it great for reading with the whole family. It can even be used for a Sunday school or home school curriculum because there is a Teacher's Guide in the back with ideas for visual aids, memory work, crafts, songs, field trips, etc. To date, the series contains four volumes – Genesis, Exodus, Leviticus, and Numbers, but I was told Deuteronomy was in the works. Let's hope so! UPDATE: Deuteronomy is now available! 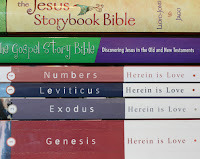 For something a little different, try The Answers Book for Kids series by Ken Ham. There are four volumes in the series and each is structured in question and answer format. The questions are genuine, serious questions such as "Why do people believe different things, Why doesn't God keep me from being sick, Why aren't there fossils of humans from Noah's flood, and Where did the Bible come from?" Each answer honestly addresses the question from the Bible while teaching the sufficiency of Scripture (2 Pet. 1:3-4) and training kids to develop a Biblical worldview. I'm sure there are more good materials out there that we haven't discovered, but these are just the ones our family has used and been happy with. Hopefully, our finds will help some other folks. Having trouble finding good books for your teen to read over the summer? Here's a fun reading list that's not all mindless fiction! Peak -- A story about a teenager who goes on a journey to climb Mount Everest with his father. He has climbed many peaks before, but he is concerned about this climb after hearing about other climber's deaths. Peak is a great adventure book, and readers will have trouble putting it down. The Heart of a Samurai -- Manjiro, a 14 year-old fisherman's son, grew up in Japan where outsiders are "savage barbarians." Although he believes these tales with all of his heart, when disaster strikes his boss's fishing boat, Manjiro and the crew must take the help of American "savages" who were on a whaling trip. Something doesn't add up, though. Why do these people seem different than what the stories told? The Homelanders series -- A thrilling mystery series about a teenager who finds himself scrambling for answers as he is pursued by a strange organization that wants him dead. There are four books in the series, and all of them are definite page-turners that boys and girls will enjoy. I Beat the Odds -- Michael Oher, famous from the movie The Blind Side, writes about what not many people know about -- life before the movie picked up. His story will surely keep the reader's attention. It's an encouraging story that's great for those struggling in bad circumstances. The Heroes of Olympus series -- Rick Riordan continues the tale of Percy Jackson and brings in some new additions to the gang in these thrilling books. These series contain all the elements that made the Percy Jackson series great, and the series will hold readers' attention for hours. 90 Miles to Havana -- A fictional story about a young boy named Julian who must be transferred to America when a "revolution" makes life in Cuba dangerous. Life in the Cuban camp in America is hard with bullies making life difficult for others. Julian and his siblings must find a way to survive there until their parents can afford to come to America to take them to a new home. A great page turner. Ashtown Burials series -- The Smith family owns a run-down motel and lives a simple life. However, when a strange visitor named Billy Bones comes and tells them to go to "a safe place," the Smiths find all kinds of strange events happening to them. Read the review of the first book here, and get a glance at the upcoming second book here. The Hobbit -- Bilbo Baggins lived an ordinary hobbit's life until a wizard named Gandalf appeared and turned his life upside down. Prepare for the upcoming movie by reading the book! Through My Eyes -- Tim Tebow, famous football quarterback, writes his life story. Tim Tebow is a great football player and a great person. This book shows readers his life story through his eyes with personal thoughts on his own actions and more. Read the review here. For my science project, I was recreating a scale made by a Japanese robotist named Masahiro Mori who studied digital animation. To learn more, click here. If you want to help me with my science project, click here. Submit your answers by Saturday, February 4th. It is not difficult to do. This is a large file, so it may take a moment to load. Check back in a couple of weeks, and I'll explain what I'm trying to accomplish. Thanks! If your family enjoys reading books aloud together, try this list. Our whole family has enjoyed listening to these stories. Charlotte's Web by E. B. White – We're never too old for this story. A Series of Unfortunate Events by Lemony Snicket – The book combines silliness and negativity with a fun use of vocabulary which results in a unique, enjoyable read. The Little House on the Prairie by Laura Ingalls Wilder – Step back in time to see what American pioneer life was like about 150 years ago. The Mouse and the Motorcycle by Beverly Cleary – Probably best-known for Ramona the Pest, Cleary's other work is fun too. Her entire series on Ralph, the adventurous mouse, is a fun read. The Lion, the Witch and the Wardrobe by C. S. Lewis – No read aloud list would be complete without this classic. If you're feeling ambitious, read through the whole series! Great stuff!